People in Miami and Miami Beach may be in for a big surprise the next time they order from Postmates. 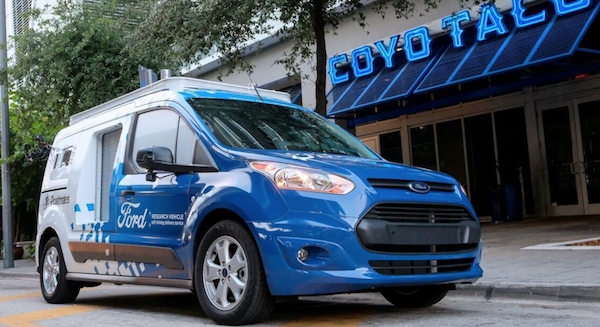 Today, Ford Motor Company announces its first pilot program with Postmates to offer on-demand self-driving delivery services from restaurants, hardware stores, coffee shops and more than 70 retailers in the Miami area. After receiving an order, the restaurant prepares and packages as it would any order it receives via Postmates. Meanwhile, the self-driving research vehicle is dispatched to the restaurant to pick up the order. After the order is loaded into the vehicle, the vehicle either picks up additional orders or proceeds directly to the customer’s address to drop off the delivery. When the vehicle arrives, the consumer is alerted on their phone, asked to proceed to the curb, and given a unique code that will give them access to the locker where their order resides. Ford has outfitted a specially-designed Transit Connect vehicle for the pilot program with an external-facing, three-locker system that secures your food and allows Postmates to serve multiple customers per delivery route. This is Ford’s first self-driving research vehicle modified to test a variety of interfaces and features to help inform the design of Ford’s purpose-built self-driving vehicle that’s scheduled to arrive in 2021. The Postmates collaboration will help inform how to transport goods more efficiently and on a larger scale, explore how new ideas and mobility solutions can transform the way people do business in our changing cities. Print article This entry was posted by Art Eddy III on June 11, 2018 at 3:30 pm, and is filed under Cars. Follow any responses to this post through RSS 2.0. Both comments and pings are currently closed.